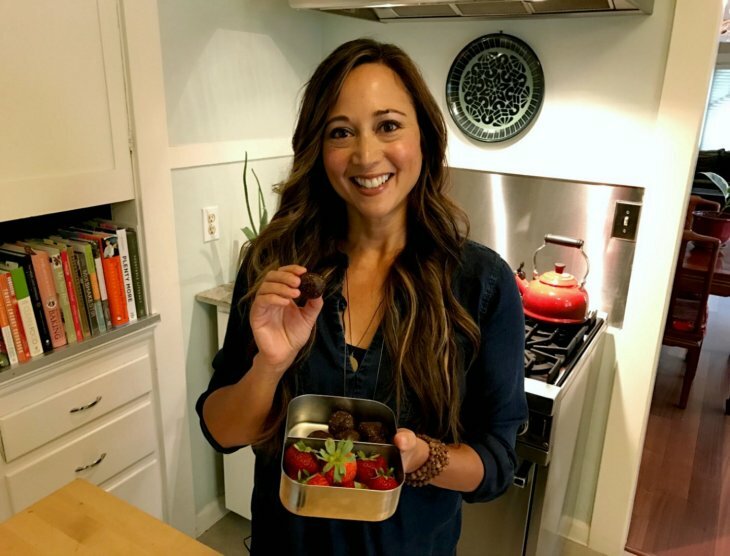 The inspiration for these No-Bake Chocolate Hazelnut Energy Bites comes from a run-in our family had with Nutella over summer vacation. We were traveling around Croatia, and wanted to pick up some Nutella for our son and his buddy. But everything was sold out except this huuuuuge jar of Nutella, which we felt compelled to cart around with us from airbnb to airbnb. The problem is, I ate way more than my fair share of that jar, and didn’t feel so great after eating a lot of it. So, I vowed to make a Nutella-inspired treat that’s much healthier, and delivers some extra fiber and protein, to boot. These treats are excellent as snacks for school lunch-boxes. They’re also great as pre- or post-workout snacks for us grownups! 1 cup Medjool dates. ***Make sure all of the pits are removed! 1/2 cup roasted hazelnuts. For deeper flavor, roast yours in a 350 degree oven for about 10 minutes, then let them cool. a splash of unsweetened plant-based milk (almond, soy, etc.) — start with a tablespoon. Extra hemp seeds, for rolling the energy bites in. Add the dates and hazelnuts to the bowl of a food processor. Pulse until mixture resembles small chunks. Add the rest of the ingredients to the food processor, along with the almond milk. Pulse until the ingredients are well incorporated, and the mixture starts to form a ball. Transfer the dough ball to a bowl, and refrigerate about 15-30 minutes. Using your hands, form bits of the chilled dough into 1-1½" balls. Roll balls in some extra hemp seed for additional texture and protein. Store in an airtight container in the refrigerator up to 1 week, or in the freezer up to 2 months. Trust me, though, they won't last that long! If you make the recipe, tag me over on Instagram. I’d love to see your kitchen creations!